the whole earth is full of his glory." At the sound of their voices the doorposts and thresholds shook and the temple was filled with smoke. The New King James [version tells us]: 'not forsaking the assembling of ourselves together, as is the manner of some, but exhorting one another, and so much the more as you see the Day approaching.' We who call Christ Savior have the right to assemble in His mighty name. We are the blood-bought, Spirit-caught church of God and the gates of hell cannot prevail against us. The hordes of darkness have no greater agenda than the widespread destruction of Christ's bride and "so much the more" as His return draws near. Satan is furious because he knows his time is short (Rev. 12:12). Some of us with little previous battle experience have no idea why God is allowing us to go through such difficult times in a place we thought was His will. He's trying to make warriors out of us, Girlfriend! Rise to the occasion! But we aren't meant to fight unseen forces alone. You and I have the God-given right to lock arms with our sister and brothers in Christ and defend ourselves with the sword of the Spirit and the shield of faith. Here's the best part: When we do, we are guaranteed the victory. I said guaranteed. 'If you fully obey the LORD you God...the LORD will grant that the enemies who rise up against you will be defeated before you. They will come at you from one direction but flee from you in seven' (Deut. 28:1a, 7). ~Beth Moore, in Esther: it's tough being a woman. I am chronically unhappy with how I look. Not that I don't think I have any good or pretty features - I do, but the overall look often leaves me cranky. A big part of the problem is that I continue to struggle with acne (not just the odd pimple or two, but batches of them). Not much makes a girl more self-conscious about how she looks than a bunch of giant red boils on her chin. I've tried a bunch of things to deal with the acne, and there are definite improvements, but nothing dramatic. So what can a girl do to feel good about her face? Frame it! Someone once told me (maybe it was on a talk show) that the eyebrows are what "frames" the picture of your face. The way they stand out, or not, will determine where others focus their gaze. I've always had blond brows that mostly blend in. (Sadly, the blond hair that matched those brows has grown in darker and darker with each passing year. Which makes the light brows disappear even more.) Until I made a face-changing discovery - brow tint! Coloring your hair isn't just for those hairs on your head anymore. You can get the brows tinted at any spa that offers esthetic services (or, if you're lucky enough to know someone with a styling licence that can purchase products from the wholesale product stores, you can get your own). A good tint will last about 4 weeks, and can make the difference between being able to go out without any makeup on, or not. When my brows are well-shaped and tinted I know that people are focusing on my eyes rather than my acne-riddled chin. Don't knock it till you try it. Go ahead, frame your face. For more Works for Me Wednesday tips visit We Are THAT Family. I find myself looking ahead to this summer with a mix of anticipation and sadness. Summer is my favourite! I love the warmth (even if we really do only get a month of it). I enjoy the freedom. I adore the beach. And if I'm honest, there is a (very tiny itty bitty wee small) part of me that basks in the lack of structure and routine. This summer, though, is our last summer before a year of changes. At the end of this summer, Braeden (11) will be going into middle school (grade six) - new school, new teachers, new friends, new bus, longer hours. Transitions such as this are particularly difficult for him, so our summer is really the calm before a stormy year. As this summer comes to a close, Malakai (1) will be turning two. I will no longer have a baby, and will not have a baby ever again. He will move into a toddler bed, start potty training (maybe? ), speak in sentences such as "I do it!" The girls will be growing up, too. Abbey's (7) change from first to second grade should be a fairly smooth transition. On the other hand, Meg's (6) move up from kindergarten to grade one is likely to put a few bumps in our road. Five full days a week is hard work! Last year Abbey came home tired and cranky until December. If anything, I expect Meg to be a little more so (she's just got a bit more personality going on). Shea (4) will move on up to the four-year-old class in preschool. It's still only two mornings per week, but so much new learning will take place - the alphabet, printing, numbers, colours, patterns... All the stuff that will give her a head start for kindergarten. I am standing on a wide expanse of beach. The shoreline is nearby - free, easy, relaxed, fun. But off on the barely-visible horizon I see the hint of things unknown, and I feel the need to brace myself. You know the expression, "good things come to those who wait?" There are few things in my life that have just happened as I sat back on my heels and waited for them. With the exception of (finally) going into labour after a long wait, most things require effort on my part. This losing weight thing is one of those effort-full experiences. I'm not a stranger to weight loss. In fact, I've done it four times over with relative success. As much as success can be measured by maintaining the loss until the next pregnancy, that is. But something about this time is different - more difficult - than the other times. along with a myriad of other great ideas justifications. If I get real with myself, though, about the reason I am simply not losing this weight, I have no choice but to accept full responsibility for it. I am not losing weight because I am not doing the work. I am not fully committed. I follow Weight Watchers for a few weeks, experience some success, and decide to take a little "break" from all the points-counting. I talk myself out of exercising regularly (I'm too busy, it's too expensive, I really don't need to). Losing weight, not yelling at the children, being a good wife, saving money, spiritual growth - all these things require work. None of them just happens based on my good intentions. And now I sit here with no good ending for this post. Because this is as far as I've come. I need to do the work. The question that lingers in the back of my mind is this - how do I keep motivated to keep up the work as time goes on? What's to prevent me from losing and re-gaining the same dumb 10 pounds I've lost and gained four times already in the past year?! 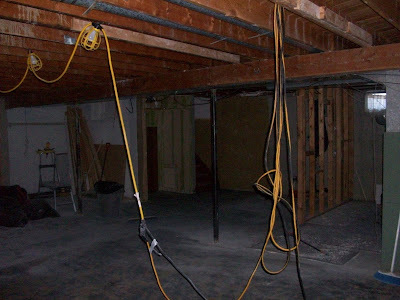 If you think a jackhammer sounds loud when you drive past construction, it is at least 10 times louder when it's going on inside your house. Even if the jackhammer is in the basement and you are in the back yard, you must shout in order to hear yourself speak. Anyone got some Advil? 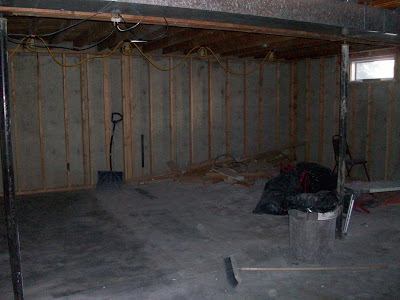 As you can see, we have made a bit of headway on the basement reno. The demolition process is so close to being done I can taste it! (And literally, we can all taste the dust whenever the furnace kicks in. Nice, eh?) 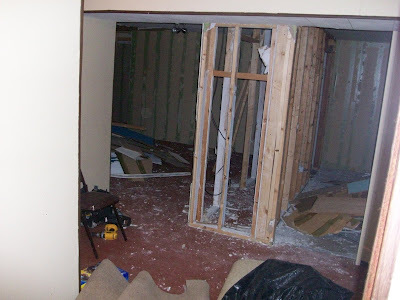 Walls are knocked down and hauled out. 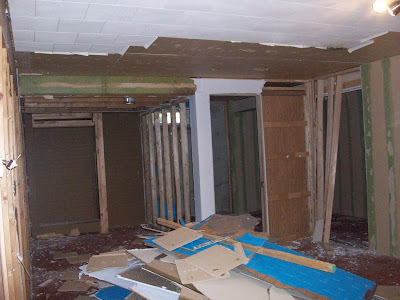 Old, moldy (ack) insulation garbaged. Glued-down carpet scraped up. Orange shag on the wall ripped down with gusto! I feel a little guilty putting that list of work on my blog, because I didn't do much of it. My husband (the super-hero) did most of it on his own, with some great assistance from my father and my BFF's teenage son. 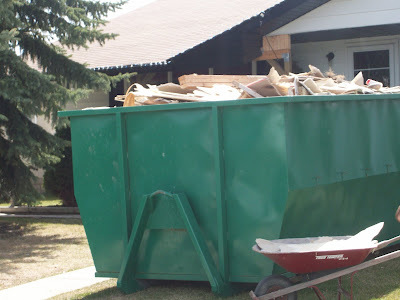 I did haul chunks of drywall and ceiling tile out to the dumpster, and I've swept the basement floor no less than forty-six times, but that work somehow doesn't compare when we're talking a massive dumpster and three or four pick-up trucks worth of garbage. See that pile of lumber and garbage bags in the corner? That is ALL that's left! Well, besides cleaning up the mess after the window holes get cut bigger. And disposing of the old furnace and ducting once the new one is in. But hey - putting in that new furnace is the first step in rebuilding. Yahoo!!! "Follow your heart." We've all heard it before. But the effects I've seen of this heart following are all too often negative - divorce, broken families, adultery, broken trust. The heart (the emotions) is a fickle thing. We tend to be motivated by what feels good, what makes us happy, by what we believe we deserve. I am so guilty of this! I frequently decide that I am not feeling loved enough by Pat. Maybe I even feel taken for granted. My heart begins to ache a little bit, and I follow it. I follow it right down the path of blame and accusation, dissatisfaction and criticism. Very soon, neither of us is "happy" in our marriage. So where would we be if I kept on following my heart down that path? Probably in a state so miserable that divorcing and breaking our family apart would seem to be the only path back to happiness. I believe it is healthier, wiser, and better for the heart if we choose to "lead our hearts." Like I said, emotions can change on a dime (they are not the best compass to follow). How much wiser would it be for us to direct our hearts (our emotions) in the way they should go? What do I mean? I mean this - regardless of the feelings, we choose to act in ways that reflect what we want to be feeling. We choose to show love regardless of how loving (or not) we are feeling. Come back with me to the place where I'm feeling unloved or taken for granted. I don't have to follow my heart to the pit of despair. No way! I can make a choice, in that very moment, to lead my heart. For me, leading my heart might look like doing something to show Pat that I love him (even though I am feeling unloved) - even better, doing something to show Pat that I respect him (more on love & respect here and here). It might be forgiving that my work has been taken for granted, and picking up the strewn laundry because I love him. It might look like clamping my mouth shut when all I really want to do is spew and vent how horrible I feel, and praying that God changes my heart (rather than praying that God changes my husband). The funny thing I've noticed is that when I lead my heart, it doesn't take long before my emotions follow where I want them to go. The feelings of hurt and discontentment ease away. Loving thoughts and feelings work their way back in. I begin to feel "happier" and my actions reflect it. And more often than not, a chain reaction begins. Rather than ending up unhappy and divorced, we end up stronger and more committed. In The Love Dare it says this: The world says to follow your heart, but if you are not leading it, then someone or something else is. The Bible says that 'the heart is more deceitful than all else' (Jeremiah 17:9), and it will always pursue that which feels right at the moment...The Love Dare journey is not a process of trying to change your spouse into the person you want them to be...The truth is, love is a decision and not just a feeling. We each have a choice to make. Follow the heart and hope to heaven we find love and feel loved. Or lead the heart and choose to be love and show love. TGC is a chance for us to record the special stories of how we see God working in our lives. It is a blog carnival, where you (the readers) are encouraged to join in by writing your own TGC post on your own blog and linking here. Just remember to link to this post from your own blog post. Read this to find out how it all started. Click here for "the rules." On the last day of our visit, as she and I were leaving a grocery store, mom tripped on a speed bump in the parking lot. Before I could even react, she was down. Truly, one moment she was walking beside me and the next she was laying on the ground with blood pouring out of her nose and mouth. Now – you have to know my mom. No mention of any pain, just striving instantly to get up because she was embarrassed. She is a tough cookie! I convinced mom to lie still until we were sure nothing was broken and with the help of several bystanders, helped her to the car and took her home. Mom was battered, bruised and swollen. Her lip was cracked and puffy, she had a scrape on her forehead and cheek and her hand was swelling up as we applied ice. Over and over she kept saying how glad she was she hadn’t broken her dentures (that happened in a previous fall), and I kept saying how glad I was she hadn’t broken her hip or anything more serious. Anyway, after a couple of hours, because of her age and because she was flying home the next day, I decided we really should take her to the emergency department. Long and short of it, it truly could have been much more serious. She had no concussion but she did have a break in the knuckle of her small finger. The doctor told her she’d require surgery and a pin because it was an ‘unstable’ break. They gave us a CD of her x-rays to take home with her and sent us on her way. I just have to interject here - I think it's worthwhile to note that the doctor didn't say "it looks like it might be a hairline fracture, but the x-rays aren't too clear" or something like that, he clearly saw a serious break on the finger and was certain it would require surgery. The next day we were at the airport sharing the events of this story to family when a man standing close to us heard mom needed surgery and said he was a surgeon. The man was obviously Jewish, a long flowing beard and a black skull cap (forgive me if that’s not what it’s called). I jokingly said, hey, we need a surgeon. He then grabbed my mom’s hand and for what ever reason, asked mom if she understood German (she does – Low German) and proceeded to pray over her hand. He then told us that he was also a chiropractor but that God was the Great Physician. When he was done praying, he told her it ‘is finished.’ Trust me – family reactions were mixed. I thought it was cool, my niece looked like she thought a kook had just prayed over her grandma, my sister in law (a nurse) looked sort of indulgent but unbelieving, and my mom – the woman who’s faith a sometimes worry about – thanked the man for his prayer and told me she thought she was healed. A few days later after a visit to her own family doctor and more x-rays….her doctor told her she was fine and nothing further was required. When my mom shared this part with me, my doubting self had to ask, "well, did he take more x-rays? did he show her the x-rays? what does he mean nothing further is required?" I wanted some sort of earthly explanation. You know, there are times that I really try to rationalize God. I want it to make sense. But today, I want to say thank you to a man who overheard a conversation in an airport and had the boldness to take my mother’s hand and pray over it. And the biggest thank you to God – the Great Physician. He absolutely showed me where my mother’s faith is – Praise God. And He heals, He really heals! Cool, eh?! Whenever I think of it I just shake my head and grin. God is so good! Thanks, Mom, for writing this story down for us. Can't you imagine me (many, many years from now) sitting and telling it to my grandchildren? Tomorrow is the 20th! 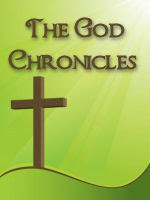 Time for The God Chronicles. I have a special post by a special guest for you tomorrow. I would be honored for you to join me in celebrating how God is working in your life - feel free to link up tomorrow. Are you willing to work to see the wonder? I was reminded of the many ways I just ask God to act - to intervene - yet am unwilling (or too lazy?) to step forward and do the work He has called me to do. Lord, deliver me from this anger that sometimes devours me. My child, where are those verses I told you to post throughout your house, to remind you what I think of anger and love? Oh God, please help me to lose this weight. Daughter, did I not tell you that you need to take care of your body? Father, will You bless and guide this ministry? You know that my blessing is already on it; you need to keep on doing the work for Me. It can be difficult to walk through life, with its highs and lows, under the watchful (and often judgemental) eyes of others. I frequently feel bad for celebrities and the gossip and conjecture that follows them wherever they go. Gain a couple pounds, "look at the baby bump!" Walk down the street without smiling or holding your spouse's hand, "trouble in paradise!" Go out on a business lunch only to find pictures of yourself and an associate of the other gender plastered on magazines, "look who's cheating!" Some might argue that this is the life they signed up for. I think more likely they signed up to do a job they loved and were (really) good at. But celebrities are just people, like us, who struggle through life, argue with their spouses, and at times get beaten down by this world. Though not quite as famous, and generally not on the cover of magazines, Christians are another group that seem to live under the microscope of others' judgements. Get frustrated and yell at the kids, "I though (s)he was a Christian?" Be seen enjoying a glass of wine or a beer while out at a restaurant, "Ohmygoodness, caught in the act!" Get caught up in gossip or passing judgement on someone else, "That hypocrite!" Some might argue that by signing up for this Christian life we have decided we are better than the rest, and therefore deserving of such judgements. In reality, we just signed up to follow the Jesus that we love. Christians are just people, too, who struggle through life, and get caught up in the junk of this world. The difference that people look for in Christians is that they should be perfect, fully living up to the standards of the Bible. The difference in Christians, though, should not be noticed in rules and regulations, codes of conduct and such. The difference is the heart. The actions of the Christian should be motivated by love and not self-serving, certainly. But even believers mess it up and act selfishly. Here, though, is what you should watch for in the Christ follower - a spirit that recognizes when it has done wrong, a heart that regrets and repents, and a person who tries to do better the next time. Any Christian you see will, at some point or another, speak or act in some way that will disappoint. They will gossip, they will yell at their children and argue with their spouses, they will be greedy and jealous, they will be vengeful, they may lie, steal, or cheat. But for those who truly believe in Jesus as their Lord and Savior, they will not be content to stay this way. You will see in them a heart's desire to be different, to love better, to forgive more quickly, to resolve broken relationships, to clamp their mouths. They will not always succeed at this. Their attitudes and actions will never be perfect. But when you watch their hearts, you will notice something different. I imagine there would be a lot less people "disillusioned" with the church today if they were looking for heart change rather than perfect behavior. The church is not a place for a bunch of perfect, plastic people; it is just a giant gathering of sinners saved by grace. People who, because of that grace, want to do better than they did before. For the re-drawing of the Mother's Day Giveaway numbers 1 through 49 were entered, and this time random.org has selected #14. Katherine said: my husband graduates from grad school this weekend -- what i'd REALLY like is a job for him, but that's probably asking a little much this week. i'd settle for some quality time with our families, who will all be here for the festivities. Congratulations Katherine! Send me your mailing details and you will receive your copy of A Sane Woman's Guide to Raising a Large Family by Mary Ostyn of owlhaven. Have you ever heard how some couples just can't work together? We've got lots friends like that - if they get working on a project together, the inevitable result is arguing. Oddly, Pat and I are at our best when we tackle a big project together. 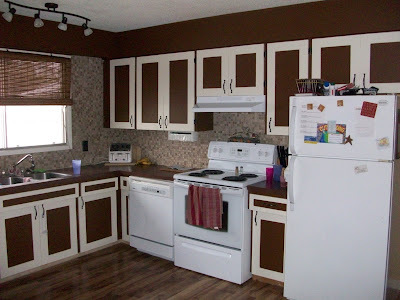 Since we bought our thirty-some-odd-years-old house three years ago, we have slowly and methodically been working our way through the necessary projects. 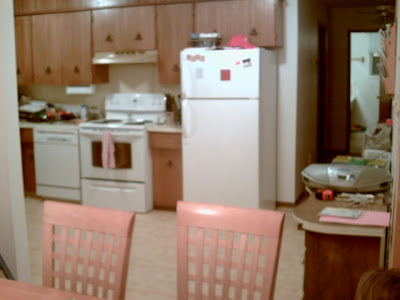 The wall straight ahead is between the kitchen and the dining room. 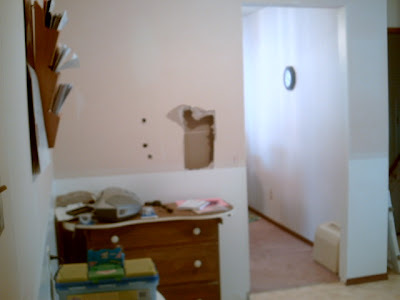 See the tiny walk-through doorway? That is how we were to bring our food to our table - through there and onto the carpeted dining room! No thank-you. 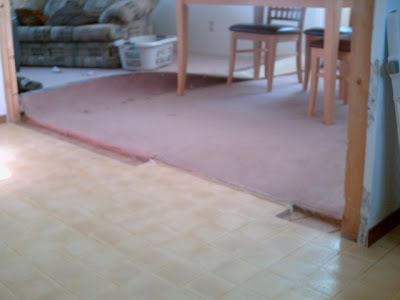 Though my camera doesn't show it well, once the wall was gone the remarkable contrast of the lemon yellow linoleum and the pink carpeting was positively blech! The lemon yellow linoleum was, I'm sure, seen as a lovely compliment to the lemon yellow glass tile backsplash when it was all originally installed. And those cupboards - again, totally top of the line thirty years ago. 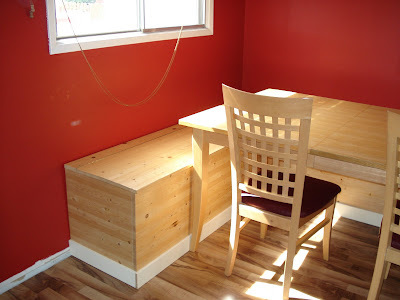 Once the wall came out (within a week or two of moving in), we felt compelled to cover our kitchen and dining room floor in something that was not lemon yellow and would not absorb every spill ever made. 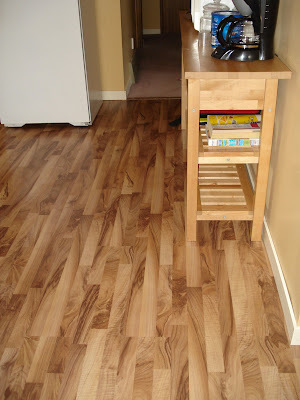 Our short-term, inexpensive solution was this laminate. Oh, and that lovely dresser you saw in the top picture - replaced by a sideboard from Ikea (I love you, Ikea). 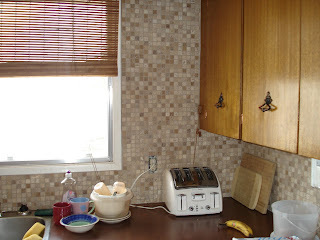 It took a year or so, but we did eventually replace the backsplash with this mosaic (for any home improvement gurus out there who are wondering - the stone is tumbled chiaro). Under the stack of dirty dishes you will also notice the dark brown counter (good ol' formica) that we put down to replace the (you guessed it) lemon yellow formica that the previous owners adored. When we (ahem, I) finally did get to the painting, we went with the dijon yellow as the main color, and this great red for the dining room and one wall of the living room. See that bench? Built by my handy hubby to help with seating and storage for our crew - the bench probably came a good year after the paint. But whatever! And finally, three whole years after the kitchen project began, the cupboards got a new look (though I still have to do a couple wee paint touch ups). 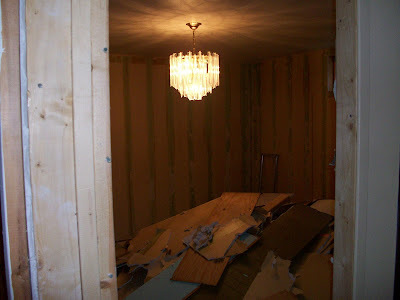 Now that we've got our main floor updated (with a few small exceptions such as the glitter in the stippled ceiling - never going to try that one, the master bedroom - maybe next year, and the bathroom - ditto), I think we'll take a little rest from home renovations. It's sure not easy to climb the slide in high heels! Each time we've added another member to our family (including canine members), I've felt the pressure to become just a little more organized. It's hard to get seven people ready in the morning, so one of the first things I established was our morning routine. This routine actually begins the night before. 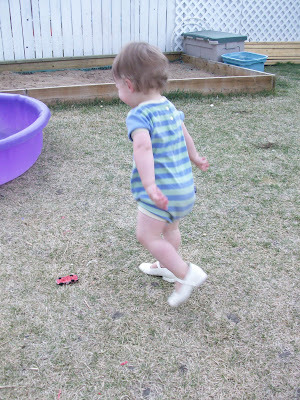 This routine has become such a part of our lives that I seldom need to tell the children what comes next. I usually just ask them, "what's next?" We have little trouble getting everyone out the door and to their buses on time, and mom and the wee ones aren't running late to do what we need to do! For more handy tips and tidbits, visit We Are THAT Family. Though I've heard these words many times, and in my heart believed them, I have never quite been able to make sense of what they mean. Waiting is hard. Waiting makes me cranky and tired. Waiting does not make me feel like an eagle, but more like a brick - weighty and lifeless. As I watched and learned from Beth Moore last night, she spoke a WORD. It is not waiting that renews our strength - but waiting on the LORD. Waiting on something - an event, a person, money - anything, saps our strength. Waiting on the thing will deplete us. It is the act of waiting on the LORD that renews our strength. But what is the difference between waiting on the thing and waiting on the LORD? It is the knowing that, while we wait, God is not inactive. God does not sit idly as we wait. When the taking of time for God's plan is moving at a snail's pace, He is busy working in the background. Something is going on to bring everything (all the other factors that don't involve us) into line. The time we spend waiting on God's will - what we call the meantime - it is God time. In our meantime, He is sorting it out! Waiting on the LORD is knowing that He is moving in our waiting. This waiting, it will renew our strength. Just a quick note on the Mother's Day Giveaway... I have not yet heard from our winner. Trisha, if I don't hear from you by end of day with your contact info, I will need to draw a new winner. Over these past eleven years and five children, I've experienced a few weight fluctuations (to put it mildly). Once the time of nursing a baby is done, I find myself in need of a serious metabolic overhaul. No time in my life, though, has been such a struggle as this past year. I have not simply struggled to lose the baby weight, but have found myself gaining - over and over again. There are these fifteen pounds that leave and return, and each time they return they bring a few friends along. You may recall my "before" pictures. My current weight is 2.8 lbs higher than it was when I started (in January of 2008). I simply have to do something about this! It is not good - I don't feel good, I don't look good, I am not healthy, I have low energy. The source of my weight problem is me. I lack the self-control to resist the junk foods I enjoy (not only can I not resist them, but I seem incapable of enjoying them in moderation). I lack the self-discipline to exercise regularly. I also know that I ultimately lack the power to change these issues in myself. I have compartmentalized this weight loss thing as separate from the rest of my life. For everything in my life, I seek God and His will. Except for losing weight. At first I believed I should be able to just do it, and it seemed a silly thing to be praying about. As time passed, I think I avoided bringing it to the Lord because I know He will ask me to change. Yesterday, I began using my Weight Watchers tools to count points again. Not simply because I want to lose weight, but because I believe it is a tool that God has provided to help me obey Him. He wants me to submit all areas of my life to Him - and that includes my health. When I feel that emotional burn that drives me to eat (and eat, and eat), He wants me to come to Him instead. I ask for your prayers as I commence this journey once again. Related post: Time for an Overhaul. Where did that phrase ever come from, anyway? Is it really possible to bless someone so much that they become rotten? 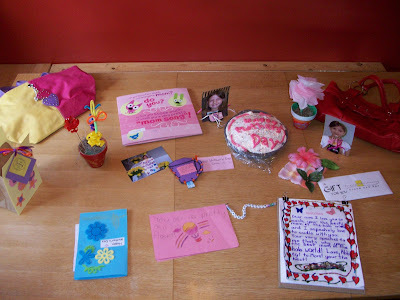 Practically this entire week has been Mother's Day around our house. I have been honored by a gift or card daily since Wednesday. First, Shea brought home a special card she made in child care at Friendship Factor on Wed (FF is our "women's time out" ministry). Meg came home from school that same day with a card and a beautiful picture taken at school. On Thursday, her playschool teachers helped Shea create a puzzle out of a cute picture of her holding a sign that said "Happy Mother's Day." Later that day Pat presented me with the one thing I really wanted. While I was out that evening, Pat took the kids shopping - they found me two fantastic purses and a hilarious singing card (no one could wait for me to open these gifts, so I got them first thing Friday morning). From school on Friday, Abbey brought home a card and a picture of her taken at school, along with a cute little flower pot. Braeden had a gift bag he decorated at school, along with a card, a lavender tea bag, and two home made chocolate chip cookies (for us to enjoy together). 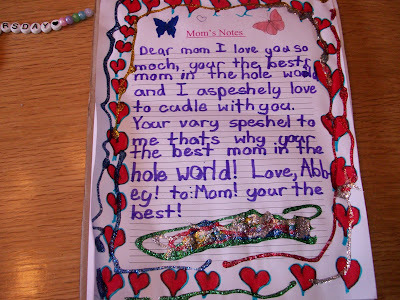 Dear mom I love you so moch, your the best mom in the hole world adn I aspeshely love to cudle with you. Your vary speshel to me thats why your the best mom in the hole world! Love, Abbey! to: Mom! your the best! I assure you, it does not escape me that I am blessed far beyond anything I deserve with these precious children and my loving husband. You don't have to worry, though - it only makes me sweeter! I would REALLY love uninterrupted sleep. How about a day without kids bickering at each other or whining? Seems my 9yo annoys my 13yo and my 3yo all of a sudden thinks whining is ok.
Trisha, if you're reading this - please send your contact info to etrowan@shaw.ca. Congratulations, and Happy Mother's Day! Tonight is date night. We've got the sitter booked and we're ready to go! Small problem, though - we don't know what to do! Overall, our list of ideas doesn't sound particularly exciting. I'm open to suggestions. Here's an idea - you vote, and we'll do what you say. Maybe. Last week I received a phone call from Braeden's teacher. Currently, he is in a program for children with severe cognitive delays (in his last year of elementary school - grade 5). Our expectation all year has been that he would continue in this program and go to the one and only middle school that offers it. This call, though, was to share good news - based on recent assessments, they would like to move Braeden UP to the program for children with mild to moderate cognitive delays! Unfortunately, the school that the teacher named is one of the two middle schools in town that I would "never, ever send any of my children to." You see, this middle school is a place of bitter memories. In the eigth grade, while I attended that school, I was violently assaulted by another girl. During his two years there, in another special ed program (for children with learning disabilities), my nephew experienced endless bullying and abuse. It is difficult to believe anything but the thought that "most of the kids at that school are just plain mean." Since the call, I have been praying for guidance, but continually felt my own emotions getting in the way of my understanding. I have been (somewhat frantically) seeking guidance from friends, other teachers, other parents, academic test results, and so on - looking mostly for evidence to back my belief that this school was no good. Not one to typically be motivated by fear, I did not recognize what was driving my search for answers and affirmation. Finally, growing weary in my own efforts, I gave up. "Lord, I can't hear Your voice over my own desires. I cannot be wise in making this decision. Please, just shut doors that I should not walk through and leave me with only one wide, open door." Not much more than half an hour later, the phone rang. It was the Intervention Services Coordinator (the decision-maker as far as placements in special ed). I methodically and unemotionally shared my concerns with her (I had practiced what to say and how to say it so I wouldn't sound like an over-emotional mother - a total ruse). She listened and validated me, assured me she wanted to work to make our family happy. Unfortunately, there was no space in this program in the school we wanted - two families would need to move out of the area for a space to open up. There was no bus to our second school of choice from our end of town. There was space, though, in one other middle school. Ironically, it was the other of the two schools I would "never, ever send any of my children to" (this one, though, for solid, valid reasons that may eventually result in that school being completely restructured) - it was my #1 never, ever school. Bang! Wham! Slam! Three doors firmly closed, only one door remaining. She asked that I keep an open mind, meet the teachers, tour the program and the school. She assured me that these are her very best special ed teachers in the entire district - in this school I feared. She promised that she had not once had any complaints from parents of children in this program and at this school regarding bullying or mistreatment by the general population. She told me that they have another child in the program who is a good match for Braeden both academically and socially. I turned toward the only door that was open for me, I took a tentative step, then I hurried right through. And the peace came. The fear dissipated. Blessed assurance that Braeden is in His hands before he is in mine. Peace that is indescribable and completely beyond my comprehending. Peace that is contrary to my basic instincts. Peace that passes understanding. Today's WFMW is a themed one - money-saving tips. Now, some might argue that receiving gifts, especially from your spouse, is not saving money at all. Rather, it is costing you money. Technically, that's true. We've all received those gifts that are not exactly what we hoped for. Sure, sometimes we keep them and keep our mouths shut, but more often we are honest with our sweethearts. So we exchange. Now just follow that trail of money - hubby's fuel to the mall, many hours spent searching for the perfect gift (and time is money), cost of the gift, cost of having someone else wrap the gift, fuel to drive home, fuel to go back out and get a card, hours spent searching for the card, fuel home, your own fuel back to the store to exchange the gift and back home again. So much waste! Ask him for what you want! Be specific and tell him exactly the gift you would enjoy. Oh stop, I can practically hear you saying, "if he loves me he'll pay attention to my hints and KNOW what I really want." LOL! No he won't! It is a proven fact - well, if not proven then certainly widely assumed - that men are incapable of reading subtle signs and hints. Seriously, just tell him what you want. And to increase the chances of him hearing and understanding, go ahead and tell him again. Now watch the money trail - fuel to buy gift, brief minutes spent requesting exact gift he knows you want, cost of someone else wrapping the gift (even if you know what it is, it's still fun to tear off the wrapping paper), fuel to get home. For more WFMW tips check out We are THAT Family. I recently had the great blessing of winning a book that I really, really wanted to read. You see, the book was written by someone I "know" (by knowing I mean: I read her blog every day and comment lots in the hopes that she'll like me *smile) and based on my "knowing" her I was certain her book would be chalk full of wisdom and handy tips for mothering. 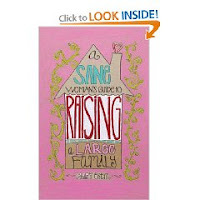 Mary Ostyn of Owlhaven has recently released her new book, "A Sane Woman's Guide to Raising a Large Family." And fyi - you sure don't need to have a large family to benefit by reading her book. It is g-o-o-d! Mary has written the guide of a lifetime! If you (like me) are struggling in any area of family life - from chores to discipline, from organizing to laundry - "A Sane Woman's Guide..." will have something for you. Mary's no-nonsense, concise approach to offering up all the tips and tidbits from her years of experience managing a family of 12 is a quick and easy read. But do NOT mistake it to be your typical quick and easy read; this book is chalk full of information! I set this book down encouraged that it really is possible to raise my family of seven (five little monkeys) AND keep my house organized and tidy AND not break the bank doing it all. If you are considering purchasing this book, let me tell you this - it will be worth every penny! If you would like your very own, brand new (read: you're not getting my copy, I'm keeping it! ), hot off the presses copy of Mary's book, leave me a comment! Not just any comment, though - tell me what you really hope to get for Mother's Day. On a side note, I would be remiss if I didn't mention my best advice for getting the gift you want from your spouse for any occasion. So don't forget to stop by tomorrow; my WFMW post is all about getting the gift you really want. You don't need to be a blogger to enter, just make sure you leave me an email address so I can let you know if you've won. * The fine print... No purchase necessary. You must leave a comment in order to be entered. If you would like to post about this giveaway, linking BOTH to this post right here AND to Mary's book (or her blog), your name will be entered FIVE times (plus another entry for your comment). Entries will close at noon (MST) on Friday, May 8th. Winner will be announced on Saturday, May 9th at 9am (MST). International entries will be accepted. Beeep. Beeep. We interrupt your regular programming for a very important public service announcement. In order to avoid severe damage caused by tumultuous tears raining down, hot windy gusts of bitter words, hailing anger and destructive hurt - listen carefully to the full announcement. You must not - not ever - never - just don't do it - ask a slightly chubby woman when her baby is due. If you do not heed this warning you will see a front of low self-image moving in. As that low pressure zone moves, it will encouter a wall of high PMS; at which time you best begin locking down the storm shutters to keep the devestation of the hurricane winds at bay. This public service announcement was sponsored by your friendly neighbourhood mother-of-five-too-busy-to-eat-well-too-tired-to-exercise women's ministry. Again, please heed this warning in order to maintain gentle breezy relationships and placid temperatures. We will now return to your regular programming. Beeep. 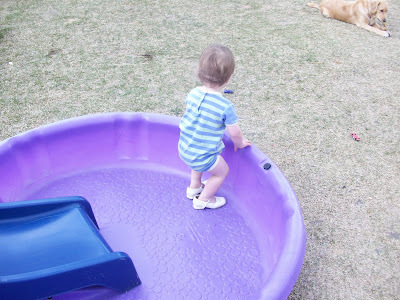 Pre-school swimming lessons are all about making the water feel fun and safe. Shea got to be in the middle of the "rosy" this time. Meg's learning to swim here - flutter kicks on the front. Abbey's group, too, decided to take the plunge. She didn't even blink. You'll notice the absence of the littlest swimmer, Kai. Around these parts you need to be 3 years old to take swimming lessons, unless your parents choose to do parent/tot lessons. I choose NOT! He gets to swim for fun with the family for now, and as soon as that third birthday comes along he can join in the fun. The girls all "passed" to the next level! And Braeden worked so hard, cooperated so well, but that treading water for one minute straight just kept dragging him down - literally. Next time, dude. 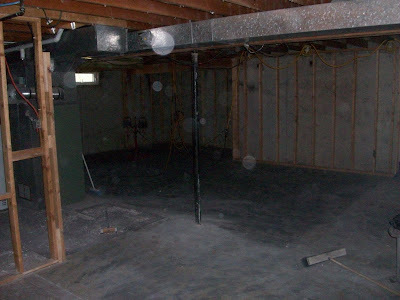 Do you ever stand in the middle of your house and think, "this old place has stayed the same for too long now," and your mind starts whirring with all sorts of ideas? 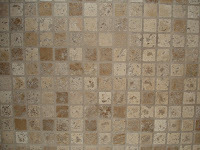 Paint, flooring, rearranging furniture, adding accent pieces, and so on. I think it's in our nature - too much sameness just doesn't sit right. I talked about complacency not long ago, and I sensed it was just the beginning of something God wanted to do in my heart. There are so many things in my life that I have allowed to just stay the same (even though I have known they are not meant to be the way they are). Today marks the first day of my overhaul. You see, lack of self-discipline is contagious in my life - once I let it slip in one area it's just a matter of time before it begins to slide in other areas. Therefore, I am implementing a little self-discipline boot camp in my life. * No more overeating or filling my body with junk. Food was designed to be enjoyed, certainly, but also to provide strength and energy so that the body can run like a well-oiled machine. Filling a machine with grease and salt and loads of sugar just clogs everything up - the body becomes more of a garbage truck than anything. * Time to start exercising with intentionality. No, I won't be running a marathon any time soon. But I will be taking time to move my body and get my heart rate going at least a few times each week. * I will also be re-focusing on my Siesta Scripture Memory verses. I've gotten sidetracked, and my last 3 verses are jiggling around like jello in my brain. I need them to be cemented in there. * Re-evaluating the budget and sticking to it. Feeling less financial strain does not mean I should not still be carefully guarding the money God has provided us. * Being intentional about giving of myself in my marriage (I am going to use The Love Dare to help me with this). * Remaining diligent in dealing with discipline issues for our children. * Sticking to the schedule I've given myself for housekeeping, ministry tasks, and so on (a schedule I created based on all this feedback). 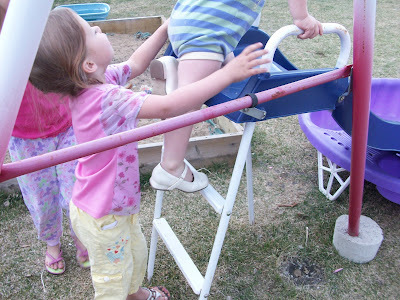 * Assigning the children household tasks so that they can be trained in the fine art of keeping up a house, and eventually become active participants with a sense of mastery over their tasks. I know if I read such a list from someone else, in the past I might be inclined to suggest that she try "just one or two" things at a time. But I have observed something interesting in people lately - they are either self-disciplined or not. I have seen few people who are well-disciplined in some areas and out-of-control in others. I believe that - through God's strength and empowering - I can switch camps. But I believe it needs to be a total transformation of virtually all aspects of my life. What Does Your Online Activity Say About You? New Post Up on Networking! Are you kidding me God? HELP!!! How much cake can one person eat? God says, "These things I plan won't happen right away. Slowly, steadily, surely, the time approaches when the vision will be fulfilled. If it seems slow, do not despair, these things will sure come to pass. Just be patient! They will not be overdue a single day!